Mikey was the first to try Life and was pleasantly surprised by the tasty and “supposed to be good for you” cereal. After he had tested the waters, his peers (brothers) were willing to give it a shot. What’s this got to do with me? And you? 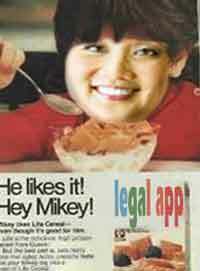 Well, I’ve been considered the Mikey of Legal Apps. 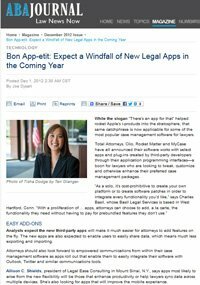 The American Bar Association recently sought me out for an interview regarding the cutting-edge new Legal Apps for my profession. Why am I proudly proclaiming this strange distinction? If you’ve been around me long enough, you know I feel like I’m technologically challenged. I still question my ability to work my Powerpoint presentation without a “clicker.” I’ll admit I can’t seem to keep up with all the changes to Facebook. I still mess up my voicemail buttons from time to time. So how did I get to be Mikey of Legal Apps? Because I’m willing to jump outside of my own comfort zone and try new Legal Apps. I’ve actually become well known for doing so! What motivates me is YOU! You, as my clients, are awesome. You’ve stretched outside of your own comfort zone. Being an entrepreneur means taking risks and being on the cutting edge of your business. I feel the same way with my own business. I stretch the boundaries in the hopes of finding the Legal Apps and technology that make me more efficient and better able to serve you. So I thank you. Without you, I’d never have the national coverage and be recognized amongst my peeps as being on the cutting edge!